Sprinkle two whole gutted and cleaned Waitrose mackerel (about 250g each), with salt and leave for 15 minutes. Rinse and pat dry with kitchen paper. Mix together a 2cm piece of peeled root ginger, cut into thin sticks, 2 tbsp soy sauce, 1 tbsp medium sherry and 1 tbsp clear honey. 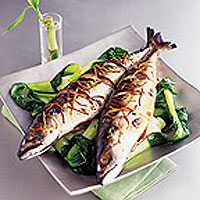 Slash the flesh of each mackerel three times on both sides and put on a grill rack lined with foil. Spoon over half the soy mixture and grill for 5-7 minutes, turn and spoon over remaining soy mixture. Grill for a further 5-7 minutes, basting until the fish flakes easily from the bone.